Department of Kinesiology and Rehabilitation Science (KRS) at University of Hawaii at Manoa (UHM) Community Outreach Committee: Kaori Tamura, PhD, ATC (Program Director, EL-GATEP), Yukiya Oba, PhD, ATC, CSCS (Clinical Education Coordinator, EL-GATEP), Morgan Kocher, MS, ATC (KRS doctoral student), Matt Niesen, ATC, Adam Slabicki, ATC (PP-GATEP students), Tyler Ono, Julia Coulon, Larissa Hughes, Cassia Denton, and Chelsea Okada (EL-GATEP AT students). We provided an athletic training focused community service event to the Ke Ola Mau Youth Summit (KYS) on March 16th, 2015 on UHM campus. The Ke Ola Mau Program supports Native Hawaiian students pursuing a college degree in a health related area. The KYS targets students from 8th to 12th grades from all over the state of Hawaii to expose and educate students about the options in health care careers and higher education. Among a variety of interactive activities they planned with other healthcare fields (e.g., paramedics, respiratory therapy, or physical therapy), the KRS had decided to provide them with informational and interactive session on athletic training to serve our community as well as to introduce and promote our profession to Native Hawaiian children during National Athletic Training Month. The event started with traditional Hawaiian chant performed by the KYS students and staff. After the introductory lecture on athletic training profession presented by Yukiya Oba, two guest speakers Brian Wong, MS ATC, the UHM assistant athletic trainer, and Keelan Ewaliko, a Native Hawaiian football student athlete shared their experiences and perspectives as a D1 collegiate athletic trainer, and as a student athlete, who suffered from injuries and under the care of Brian. The second half of the event included breakout sessions: Concussion assessment activity and UH Athletics facility tour. In the concussion management activity, students enjoyed a series of balance testing, as well as memory tests after an informational session on importance of proper concussion management plan. The facility tour involved UH Athletics Weight Training Room, Stan Sheriff Center, and Saake Athletic Training Room (ATR). In the weight training room, Tommy Heffernan, who is also a Native Hawaiian, gave a brief talk on the strength and conditioning program operation. Stan Sheriff Center tour was led by Kekoa Seward, an assistant arena manager, who talked about some of the fascinating features of the arena. Lastly, Brian Wong gave a tour in the ATR where students were able to see some athletes getting treated by athletic trainers. 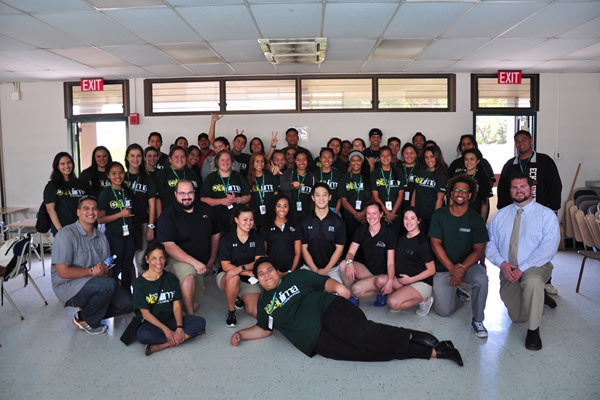 Overall, we felt the event was successful in promoting the athletic training profession to Native Hawaiian students by having them exposed to a variety of aspects in our profession. This activity was also beneficial for our AT students in professional development and to gain their cultural competence and ethnic sensitivity. Finally, this activity nicely aligns with our UHM mission of “serving with aloha the local communities that surrounds us”.